The first military trained gang member was a river pirate in the 1790s. The river pirates conducted similar activities to today’s gangs, with a selection of ambushes, assaults, thefts, and robberies of both travelers and merchants. Perhaps the biggest difference between those gangs and contemporary gangs was their mode of transportation. Today’s street gang and domestic terrorist group members typically travel by automobile and outlaw bikers travel by motorcycle. As neither had yet been invented, the river pirates of the 1790s traveled by boat, horse, or foot. Samuel Ross Mason was born in Norfolk, Virginia on November 8, 1739. He was raised in what is now Charles Town, West Virginia. He was accused of being a horse thief as a teenager. In 1767, he married and about 1773 moved his family to Ohio County, Virginia. Sam was respected as an upstanding citizen, and in 1777 Governor Patrick Henry commissioned him as a Captain of the Militia. On September 1, 1777, Mason’s militia company went to check out a report of an Indian near the fort. Mason’s company saw an Indian, and followed him right into an ambush. Several of Mason’s men were killed or wounded. Mason was wounded twice, but managed to hide. Mason recovered from his wounds. In 1778, property was missing from Fort Henry, and Mason was a suspect. Not long afterwards, Mason moved his family to Washington County, Pennsylvania where he bought a 500 acre farm. In July, 1779, Mason commanded an expedition to destroy some Munsee Indian towns on the Allegany River. That made him popular back home. In July, 1781, he was elected justice of the peace and a few months later, he was named as an associate judge. By 1782, Mason appeared to have become successful, but he was actually deeply in debt. To avoid the consequences of his problems, Mason took his family down the Ohio River and stopped in Red Banks, Kentucky. In 1784, Red Banks was a lawless place. Many of its citizens had come there to escape the law. Mason expanded his criminal activities at Red Banks, counterfeiting and selling fake land certificates. In 1785, Mason’s Pennsylvania farm was sold to pay off his debt, but the sale only brought in half of what he owed. By 1789, the Pennsylvania court sent a man to attempt to collect the remaining debt or to arrest Mason. Once he learned of the debt collector, Mason moved his family downriver to Diamond Island. After a few years of the Mason Gang preying on travelers and boats up and down the Ohio River, a group of local citizens formed the “Regulators” to seize Mason and his gang. It quickly became a popular stopping place for the men who were transporting goods up and down the Mississippi river. While the prostitutes in the brothel kept the boatmen busy, Mason’s gang members checked out their cargo. The gang members would steal from the boats and often killed the boatmen, taking the stolen boats downriver to New Orleans where they sold the contents. Eventually, the Regulators began to put pressure on Mason’s operation at Cave in Rock and sought to arrest him, so he fled to the Natchez Trace where he became a Land Pirate. Today, the Cave in Rock area is a state park. Located close to both Paducah, KY and Metropolis, Illinois, Fort Massac reigns majestically over the Ohio Rover. The rich history of the site of Fort Massac began when Native Americans took advantage of its strategic location. European explorers did the same as early as 1540, when Spanish explorer Hernando DeSoto and his soldiers constructed a primitive fortification to defend themselves from hostile native attack. The French built Fort De L’Ascension on the site in 1757, during the French and Indian War, when France and Great Britain were fighting for ultimate control of central North America. In 1759-60, the structure was rebuilt and renamed Massiac in honor of the then French Minister of Colonial Affairs. It came under fire only once, when unsuccessfully attacked by a group of Cherokee. Following the end of the French and Indian War in 1763, the French abandoned the fort and a band of Chickasaws burned it to the ground. The British anglicized the name to “Massac” but, despite the counsel of their military advisers, they neither rebuilt nor re-garrisoned the fort. This oversight left them vulnerable and in 1778, during the Revolutionary War, Colonel George Rogers Clark led his “Long Knives” regiment into Illinois at Massac Creek. From there he was able to capture Kaskaskia, 100 miles to the north, without firing a shot, thus taking the entire Illinois Territory for the State of Virginia and the fledgling United States. In 1794, President George Washington ordered the fort rebuilt, and for the next 20 years it protected U.S. military and commercial interests in the Ohio Valley. The Fort was in operation during Mason’s time, and likely served as a deterrent while in that part of the river. Clark and his command traveled the Ohio from from June to August of 1778, during which they occupied the area around Fort Massac. Rothert noted that while his (Mason’s) brothers served with Colonel Clark, Mason, too, was a Revolutionary soldier. It would not be too much of a stretch to imagine that when he moved to the Ohio River area it was not the first time he had been there. The Mason Gang moved downriver to the territory known as Spanish Louisiana and became land pirates (highwaymen) on the Natchez Trace, robbing and killing travelers who traversed the 440 miles of wilderness between Nashville, Tennessee and Natchez in the Mississippi Territory. The Trace was often used for return overland travel by folks who had taken a boat down the Mississippi River. Mason was finally caught in southeastern Missouri, and his trial in a Spanish court resulted in a guilty verdict. Although he escaped during transport shortly thereafter, a $2,500 reward motivated two of his fellow criminals and they brought in Mason’s head in September 1803. Sadly, they were unable to accept the reward money as they, too, were wanted men. Here’s the video of a visit to the Ohio River to see Mason’s haunts – it’s under two minutes . . .
Carter F. Smith, J.D., PhD, is a university professor and retired U.S. Army Criminal Investigations Division (CID) Command Special Agent. 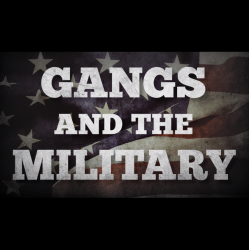 His book, Gangs and the Military: Gangsters, Bikers, and Terrorists with Military Training, published by Rowman and Littlefield, is available at bookstores everywhere, and the publisher’s site.